^ See also You'll either love it or hate it, BBC News, (23 July 1999) ; Kennedy, Maev (13 May 2000), “Modern art wins battle of Trafalgar Square: Vacant plinth will be showcase for contemporary sculpture”, The Guardian (London), http://www.guardian.co.uk/culture/2000/may/13/artsfeatures1 ; Marre, Oliver (11 May 2008), “The artist gets back in the saddle”, The Observer (London), http://www.guardian.co.uk/artanddesign/2008/may/11/art.news4 . ^ For photographs of Bill Woodrow's Regardless of History, see Bill Woodrow, Regardless of History, 2000, Cass Sculpture Foundation, オリジナルの1 August 2011時点によるアーカイブ。, https://web.archive.org/web/20110801021328/http://www.sculpture.org.uk/BillWoodrow/sculpture/regardless-of-history/ 2008年2月12日閲覧。 . ^ Rachel Whiteread, Maquette for Monument, 1999, CASS Sculpture Foundation, http://www.sculpture.org.uk/sculpture/638/maquette-for-monument/ 2015年2月10日閲覧。 . ^ From Beckham to Lapper, the ever-changing cast, The Independent, (August 2008), http://www.independent.co.uk/arts-entertainment/art/news/from-beckham-to-lapper-the-everchanging-cast-887463.html . 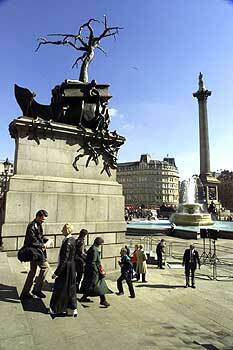 ^ Square's naked sculpture revealed, BBC News, (19 September 2005), http://news.bbc.co.uk/1/hi/england/london/4247000.stm . ^ Sooke, Alastair (28 February 2009), “Fancy turning yourself into a work of art? 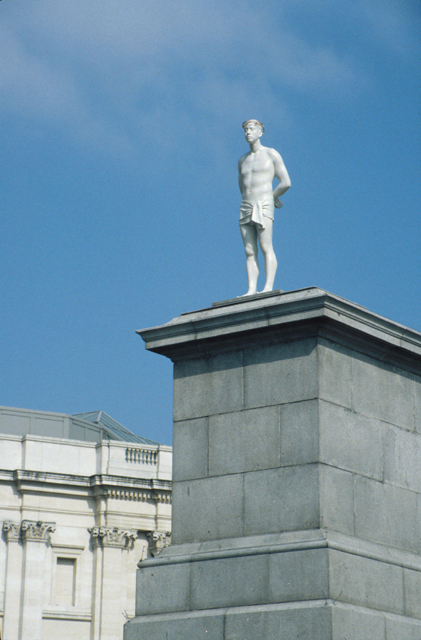 : Sculptor Antony Gormley is giving 2,400 people the chance to spend an hour alone on the Trafalgar Square plinth”, The Daily Telegraph (Review) (London): 10–11, http://www.telegraph.co.uk/culture/4838343/Antony-Gormleys-Fourth-Plinth-Trafalgar-Square.html . ^ a b “Trafalgar Square fourth plinth art 'will cause arrests': The artist Antony Gormley, who is behind the new work for Trafalgar Square's empty fourth plinth, has said he expected the piece to lead to arrests”, The Daily Telegraph (London), (26 February 2009), http://www.telegraph.co.uk/culture/culturenews/4840197/Trafalgar-Square-fourth-plinth-art-will-cause-arrests.html 2010年5月25日閲覧。 .